To knit or not to knit — that is the question! Traditionally women have been knitting for years. Sometimes out of necessity and sometimes purely for pleasure. Today it is more than a necessity and certainly more than just a pleasure. With the massive array of colours and textures there certainly is a wool for everyone out there. Here at Grandma’s Attic we have something to suit everyone. From the very beginner to the most advance knitter! 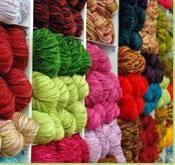 We stock all the best wool including Sirdar, Wendy, Peter Pan, Stylecraft, Rico, Patons and many more! We also have in stock the new Can Can and Can Can disco scarf wool in many colours. 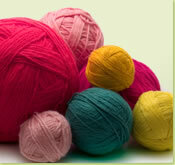 We have 100% Aran Wool and 20 or 25% wool for your Aran Sweaters in many colours including tradition aran, and we have the budget balls for knitting soft toys. All the fashion wools are also stocked at Grandma’s Attic. We stock kits for children, who will take great delight in seeing a scarf grow in front of their eyes and then take great pride in wearing it ~ even in the middle of summer! We stock a huge range of buttons, ribbons, zips, needles and all haberdashery requirements to finish off that home made garment and turn it into something straight from the catwalk. If tapestry or cross stitch is more your thing, then a visit to Grandma’s Attic is a definite YES for you. We have a large range of tapestry canvases, cross stitch kits and cross stitch canvas, plus all the colours of the rainbow in Anchor wool and silks. We have ready to embroider table centres and dressing table sets or if you have your own fabric you wish to personalise, we have lots of iron on transfers to choose from. All this in a very relaxed atmosphere with no one to hassle or hurry you. If you need any help a member of staff is always on hand to help or advise you but we feel you will be happier left alone to really lose yourself in all the wonderful things around you.